Before the voyage of Columbus in 1492, the Atlantic Ocean stood as a barrier to contact between the people (and their ideas and institutions), plants, animals, and microbes of Eurasia and Africa on the one hand and the Americas on the other. Following Columbus’s voyage, the Atlantic turned into a conduit for transferring these things among the four continents bordering the ocean in ways that affected people living on each of them. 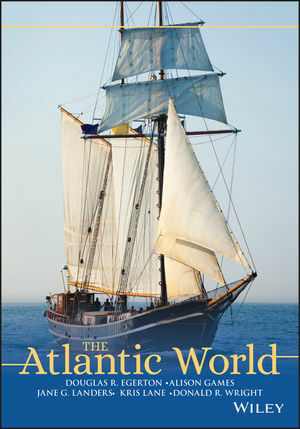 The appearance of The Atlantic World marks an important achievement, for it stands out as the first successful attempt to combine the many strains of Atlantic history into a comprehensive, thoughtful narrative. At the core of this ground-breaking and eloquently written survey lies a consideration of the relationships among people living in Europe, Africa, and the Americas, with a focus on how these relationships played important roles—often the most important roles—in how the histories of the people involved unfolded. The ways of life of millions of people changed, sometimes for the better but often for the worse, because of their relationship to the larger Atlantic world. And unlike existing texts dealing with one or another aspect of Atlantic history, The Atlantic World does not subjugate the history of Africa and South America to those of the “British Atlantic” or Europe. With historians and other scholars beginning to reconceptualize the Atlantic World as a dynamic zone of exchange in which people, commodities, and ideas circulated from the mid-fifteenth century until the dawn of the twentieth century, the interconnections between people along the Atlantic rim create a coherent region, one in which events in one corner inevitably altered the course of history in another. As this book testifies, Atlantic history, properly understood, is history without borders—in which national narratives take backstage to the larger examination of interdependence and cultural transmission. Conceived of and produced by a team of distinguished authors with countless hours of teaching experience at the college level, this thoughtfully organized, beautifully written, and lavishly illustrated book will set the standard for all future surveys intended as a core text for the new and rapidly growing courses in Atlantic History. Douglas R. Egerton is Professor of History at Le Moyne College. He is the author of the forthcoming Death or Liberty: African Americans and American Revolution (2007), He Shall Go Out Free: The Lives of Denmark Vesey (1999), Gabriel’s Rebellion: The Virginia Slave Conspiracies of 1800 and 1802 (1993), and Charles Fenton Mercer and the Trial of National Conservatism (1989). Alison Games teaches Atlantic history at Georgetown University, where she is the Dorothy M. Brown Distinguished Professor of History. She is the author of Migration and the Origins of the English Atlantic World (1999), winner of the Theodore Saloutos Prize in Immigration and Ethnic History. She has written extensively on different aspects of Atlantic history, and her articles have appeared in such journals as Slavery and Abolition, Itinerario, the American Historical Review, and the William and Mary Quarterly. Jane Landers is Associate Professor of History at Vanderbilt University and the author and editor of a number of books on Africans and the circum-Atlantic world, among them the prize-winning Black Society in Spanish Florida. Kris Lane is Associate Professor of History at the College of William & Mary in Williamsburg, Virginia. His books include Pillaging the Empire: Piracy in the Americas, 1500-1750 (1998) and Quito, 1599: City & Colony in Transition (2002). His other published works treat the topics piracy, Slavery, gold mining, headhunting, and witchcraft in colonial Ecuador and Colombia. He is currently completing a book on the early modern emerald trade. Donald R. Wright is Distinguished Teaching Professor of History at the State University of New York-Cortland, where he teaches African, African American, and world history. He is the author of The World and a Very Small Place in African: A History of Globalization in Niumi, The Gambia (2nd ed., 2004), and two books in Harlan Davidson’s American History Series: African Americans in the Colonial Era: From African Origins through the American Revolution (2nd ed., 2000), and African Americans in the Early Republic, 1789-1831 (1993).